First up, a reminder: Sharon Lee and Steve Miller will be reading from and signing copies of the Thirtieth Anniversary Edition of Agent of Change at Children’s Book Cellar, 52 Main Street, Waterville, Maine 04901, on Friday, November 2, from 7:30-9 pm. Looking forward to seeing you — yes, you! — there. If you are unable to attend the November 2 event, and you want a signed copy of the anniversary Agent of Change, with the awesome Sam Kennedy cover, you may send an email before November 2 to Ellen Richmond at kidsbookscellarATmyfairpointDOTnet, with “Lee and Miller” in the subject line. In the body of the letter let Ellen know how many books you want, your snail address, and any personalization request you may have. She will contact you for further necessary information. So, we attended the Community Health Needs Assessment as our Floating Day Off, on Thursday. It was interesting, and even informative. I had been under the impression that the event was hosted by one of the area hospitals; in fact it is an on-going collaborative effort of about eight different hospitals, clinics and health associations. The meant that there were a lot of professionals present, which was fine; one of the problems identified by our table (all civilians, saving the facilitator and the note-taker) was a lack of access to care, including a lack of doctors, a lack of transportation to get to doctors, and a lack of those activities supportive of good health. Unfortunately, the lack of access which was so obvious to the public eye was invisible to the professional eye, as we found when it came time to rank the most pressing needs in our community. The vote went along, dare I say, party lines, with the professionals pushing for programmatic solutions to things like the opoid crisis and self-harm. That was a little disappointing. Our facilitator thanked our table for our real-world perspective, but I’m not completely certain that she has any high-level ears available to her. One of the things that seems obvious to me (warning) is that, if this is about COMMUNITY Health Needs, then the COMMUNITY needs to get involved. The city needs to get on-board with providing, say, a real bus service, so people can get to their appointments on time. The clinics need to coordinate; health and exercise classes in the city need to be expanded, supported, and advertised. If we’re all in this together, we can’t solve our problems by working separately. We haven’t quite settled on the upcoming week’s Floating Day Off; much depends on the outcome of phone calls that need to be made tomorrow. For today, I need to vacuum the house, and then get to work. Oh! I keep meaning to show y’all this. . .The Carousel Corner in my bookshelf. Wow, that jigsaw batwing horse is something special – very expressive in that dark wood. 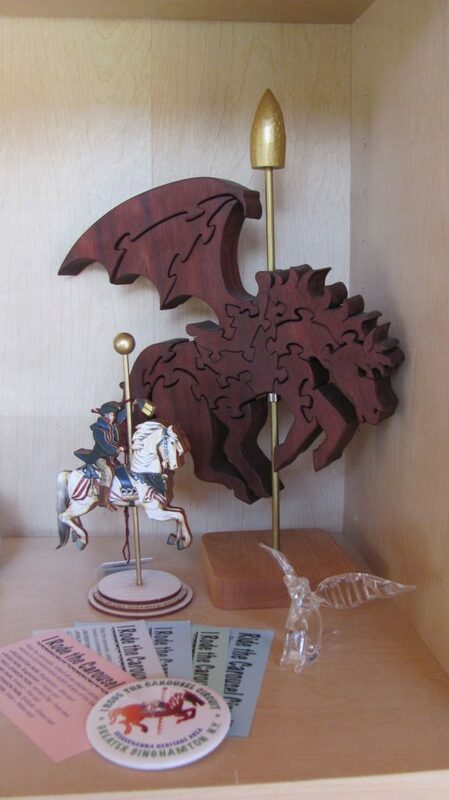 And I love that dragon carousel puzzle! I’m not sure how it works, either. In theory — at least according to the internet — both Lyft and Uber exist in the city. Since I can envision no circumstance in which I would take an Lyft or an Uber, I don’t have any feel for how many they are, and how prompt they are. The taxis in Waterville are usually backed up for a couple hours, no matter when you call, and the so-called bus services apparently considers that adherence to a schedule is for Other People.